Sometimes it’s rational to walk away from something you’ve invested a great deal in. 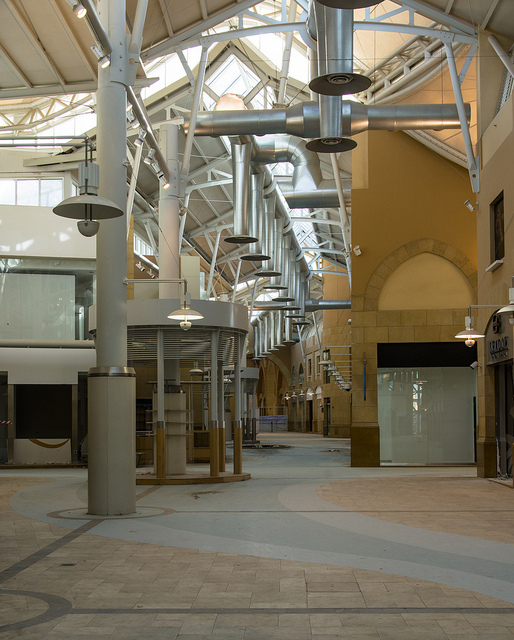 It’s hard imagine how investors could abandon something as large and expensive as a shopping mall. And yet it must have been a sensible decision. If anyone disagreed, they could buy the abandoned mall on the belief that they could make a profit. Most of us have not faced the temptation to keep investing in an unprofitable shopping mall, but everyone is tempted by the sunk cost fallacy in other forms: finishing a novel you don’t enjoy reading, holding on to hopelessly tangled software, trying to earn a living with a skill people no longer wish to pay for, etc. The first step in a growth policy is not to decide where and how to grow. It is to decide what to abandon. In order to grow, a business must have a systematic policy to get rid of the outgrown, the obsolete, the unproductive. It’s usually more obvious what someone else should abandon than what we should abandon. Smart businesses turn to outside consultants for such advice. Smart individuals turn to trusted friends. An objective observer without our emotional investment can see things more clearly than we can. As I read this, I am reminded of an article I read in the HBR’s Top Ten collection that defined strategy as decided what not to do. I think abandoning is the reactive response to the sunk cost fallacy, and strategy could be the proactive response. I’m not a math guru, and no longer much of an analyst. I keep reading your blog for your excellent ability to present wisdom so succinctly. This and the natural optima post are exemplary. Thank you for the many lessons over the years. John, very pertinent in today’s healthcare environment. I don’t think we celebrate the decision to abandon enough. It’s seen by default as a failure, whose actual success always needs justifying. But as your quote from Drucker makes clear, businesses—and projects, and one’s own life—often need to be pruned in order to grow optimally. Discovering, diagnosing and then discarding a bad idea is hard work and a job well done. If a feature turns out to be a bad idea, redundant or just impossible, terminate such bad features with a glad heart. If 25% of your specification (measured by time estimates) turns out to be just bad news, and you close those features, you’ve just quarter-completed your potentially huge project in a few minutes. If that strikes us as some kind of cheat, then maybe that’s because we didn’t have enough faith in our time estimates in the first place…. I’ve never been a blind worshiper of Steve Jobs, but I think this “strategic abandonment” idea goes hand-in-hand with his greatest strength (in my view) — a strong ability to say “no” to many things in order to focus on a few key things. As corporations and individuals, we tend to hang onto things out of loyalty or habit, rather than systematically weeding them out and celebrating this work as a victory.